Our love story began in Saint Louis, back in 2014. If you know Brian, you know he is a die-hard fan of our University's basketball team, the Billikens! During a game, you could always find him with his best friend Ian in the student section. On a cold winter night, Jessica decided to go with her very close friend, Rose, to her first ever basketball game. She noticed she was standing to a very cute guy, and that he was VERY into the game, so what better thing to use as a conversation starter. Brian was not interested in any distractions while watching a close game, and made his friend switch spots with him after a beer run. Little did the two know, they would meet again outside of a bar a couple weeks later. This time, Brian was more interested! He got her digits, and they clicked right away! Dates evolved from getting frozen yogurt with walks in Forest Park to many beach vacations. In particular, they loved their annual trips to California with stops at Laguna Beach. 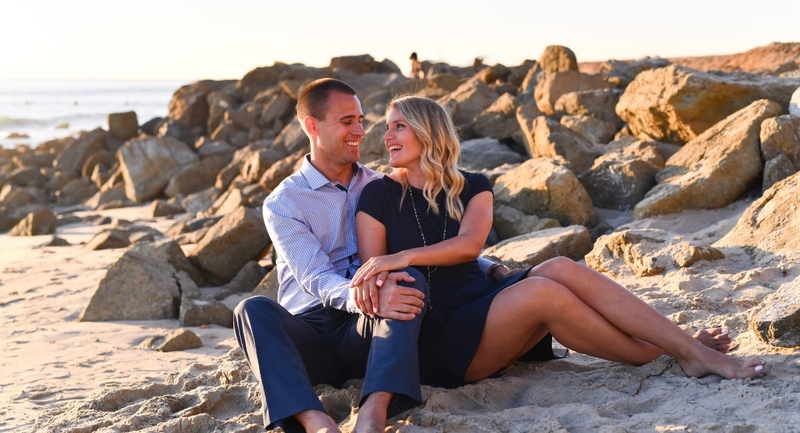 During their last trip, on November 21st, 2017, Brian proposed to Jessica with a romantic sunset in front of the Ritz Carlton in Laguna Niguel with her whole family secretly watching! We want to thank you for your ongoing love and support. We are excited to share this very special day with you all and look forward to dancing the night away with our favorite people! So, have fun, take a look around, and don't forgot to RSVP!